Tuesday March 27th 1900 We went to town in the morning. Lee is about as he was on Saturday. We came home in a pouring rain. Did the evening work & read. Wednesday March 28th 1900 I was busy with the work all forenoon and sewed some in the afternoon. A cloudy ugly day and rained part of the time. Thursday March 29th 1900 This is Lee's birthday and a cloudy ugly day with snow in the evening. I was busy about the house a great part of the day. Ossie here a little while. 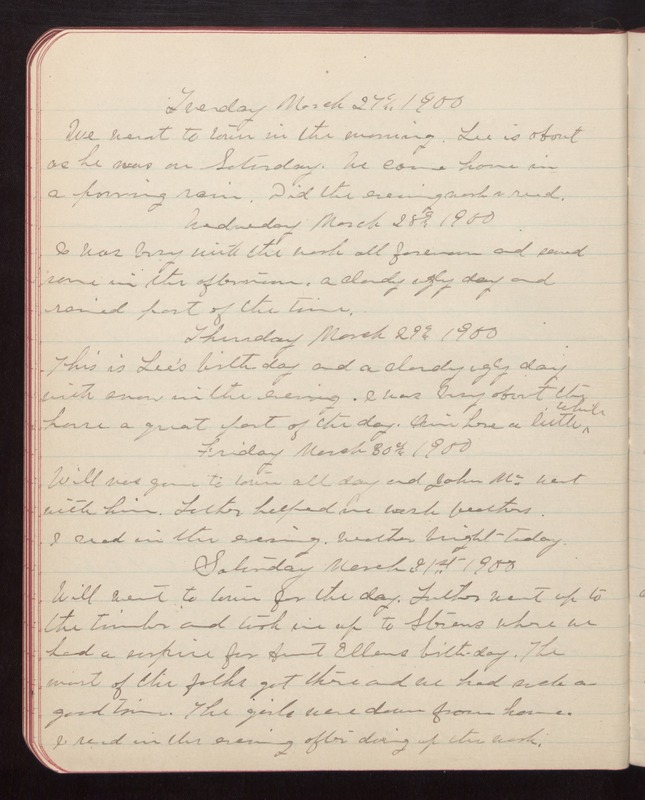 Friday March 30th 1900 Will was gone to town all day and John Mc. went with him. Luther helped me wash feathers. I read in the evening. Weather bright today. Saturday March 31st 1900 Will went to town for the day. Luther went up to the timber and took me up to Stevens where we had a surprise for Aunt Ellens birthday. The most of the folks got there and we had such a good time. The girls were down from home. I read in the evening after doing up the work.